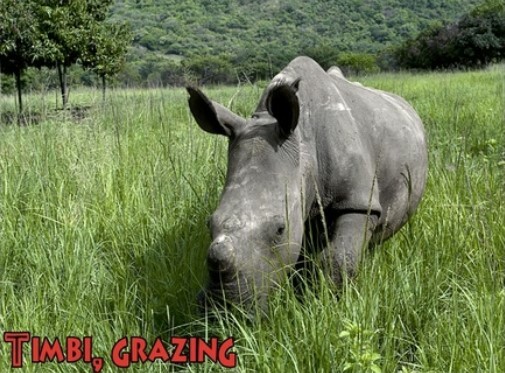 Baby Rhino Timbi at Baby Rhino Rescue | Adopt and Donate Now! Timbi is a much beloved rhino. She arrived at Care for Wild Africa in 2012 when her mother was shot in the Timbavati Nature Reserve bordering on the Kruger National Park. She was 4-6 months old. Timbi didn’t have much competition for affection and was brought up by Angelique, one of the managers at C4WA. Because she had everyone’s sole attention, she got used to human attention and remains so. She is very friendly to the volunteers and loves to greet them when they arrive. She loves her milk bottle and if it doesn’t arrive on time, she whines like a child. When she eats she makes little squeaks and crying noises that are heart-wrenching. She especially loves her mud baths and being hosed down with water on a hot day in the bush. Timbi is best friends with Olive and Forrest, though Forrest is quite a bit smaller, so the two bigger rhinos will bully him a little. She is coming to know Hawk and accepting him too. During the day she is let out of the enclosure and is free to wander and socialize with the other rhinos and graze on the succulent grass in the fields surrounding the enclosure.